The heavyweight acting talent just keeps hopping on board the Black Widow train. Marvel Studios has cast British star of stage and screen O-T Fagbenle in the solo standalone flick for Natasha Romanoff, the onetime agent of S.H.I.E.L.D. and founding member of the Avengers. (via Deadline) Although his role is described only as a "leading" one, it seems likely that he'll be the film's main villain, in light of a report from last month indicating that the production was seeking a "black British or African" actor to portray its heavy. It was reported at the time that Moonlight actor Andre Holland was being considered for the role; Fagbenle appears to have snared it instead. The actor is perhaps best-known to American audiences for his work on Hulu's hit series The Handmaid's Tale, on which he portrays Luke Bankole, the husband of Elisabeth Moss' June Osborne (AKA Offred) before the formation of Gilead, and the father of her child. He's also appeared on all three seasons of the HBO comedy series Looking, and in the British crime dramas The Interceptor and The Five. 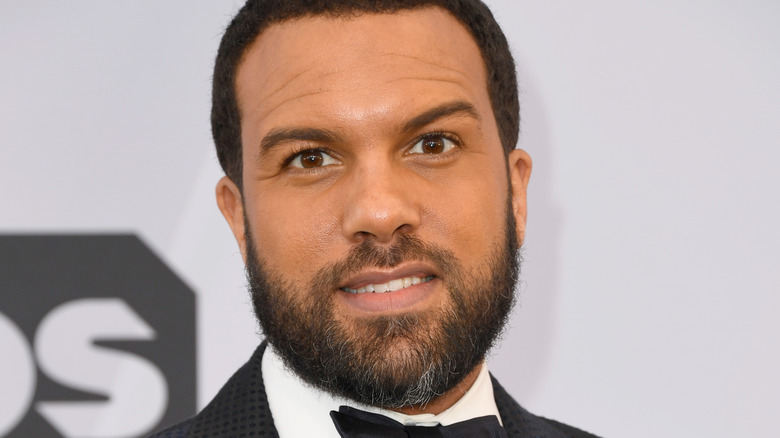 Fagbenle, a classically trained actor, began his career in theatre in the U.K. at the age of 14. He made a name for himself appearing in several well-received productions while training at the Royal Academy of the Dramatic Arts, with his stage career culminating in an Olivier Award for a production of Ma Rainey's Black Bottom. He made his big screen debut in 2006, starring opposite Jude Law, Juliette Binoche, and Robin Wright Penn in the drama Breaking and Entering. Fagbenle's Big Bad will square off against Scarlett Johansson's Romanoff, alongside a cast that already includes a formidable array of talent. Rising star Florence Pugh (Fighting With My Family) was first to join the cast; she was soon followed by David Harbour (Stranger Things) and Rachel Weisz (Disobedience). At the helm of the standalone will be Aussie director Cate Shortland (Lore), who will be working from a script by Jac Schaeffer (who contributed to this year's smash Captain Marvel and will showrun the Vision and the Scarlet Witch limited series for Disney+), which recently underwent slight revisions courtesy of Ned Benson (the Disappearance of Eleanor Rigby series). While Marvel Studios has been mum about which of their in-development titles will follow this July's Spider-Man: Far From Home, it seems like an extremely safe bet that Black Widow will not only hit screens in 2020, but will likely be the first MCU feature we'll see that year. It seems to be a bit further along in the casting process than Eternals, which has landed stars Angelina Jolie and Kumail Nanjiani; Widow also promises to tell a slightly smaller story, detailing the exploits of the superspy in her pre-S.H.I.E.L.D. days in the mid-'00s. Eternals, by contrast, will focus on the origins of the titular race of super-beings created by the Celestials, telling a tale which Marvel Studios head honcho Kevin Feige says might take place "over thousands of years." At this point, it's impossible to parse out what purpose Black Widow — which, again, will take place before the Iron Man armor was even a gleam in Tony Stark's eye — will serve to whatever larger narrative Marvel has planned for Phase 4 and beyond, but you can bet your bottom dollar that it will tie in somehow. Besides the two projects, there are four more that have been confirmed for the MCU's post-Infinity Saga slate: Doctor Strange 2 (which will see the return of Benedict Cumberbatch as the Sorcerer Supreme), Black Panther 2 (with Chadwick Boseman likewise reprising his role, and writer/director Ryan Coogler set to return), Guardians of the Galaxy Vol. 3 (which writer/director James Gunn will oversee) and Shang-Chi (which has landed screenwriter Dave Callaham and director Destin Daniel Cretton). It would be only fitting if Black Widow were to help lead off the MCU's Phase 4; after all, fans have only been waiting for it forever. Feige has promised that Marvel's future plans will become more clear after the release of Far From Home, so we should have a better idea of when the flick will be heading our way at some point this summer. In the meantime, expect the casting news to keep coming fast and furious; we'll keep on fielding it, and keep you informed as it breaks.